David: People have some very funny ideas about the canal. 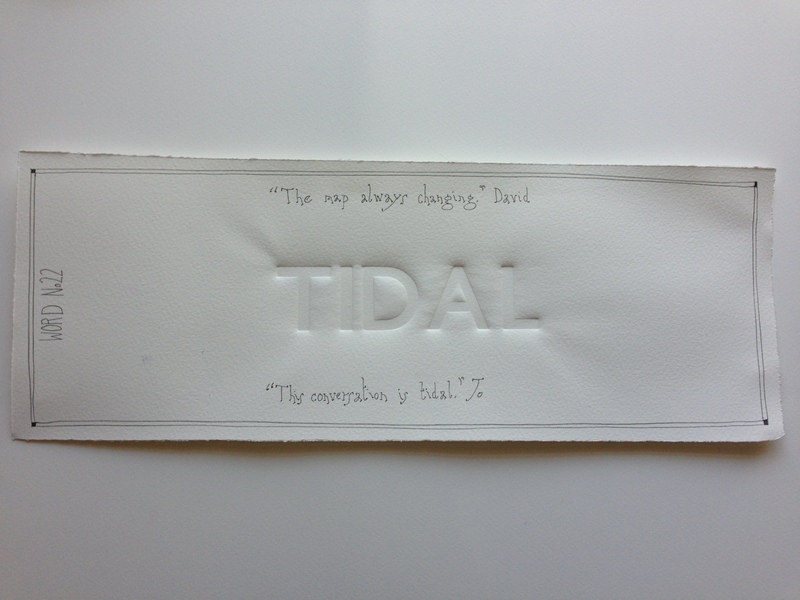 Today a walker on the towpath asked me if it was tidal. I bit my lip and explained how the water in the canal actually works, all the time imagining the canal ebbing out, leaving a landscape of mud and shopping trolleys, a forest of broken glass and cans, coconuts and pennies. This made me think about the emotional tides in our lives. What flows in and covers us, what ebbs out and leaves our inner landscape exposed. The rock pools of memory that stay filled whatever the tidal pull responding to unseen forces does. Growing up on the edges of the Thames Estuary, the tide always amazed me as a child. The regularity of the event of revealing the mud and yet the subtle changes in time across the days. The regularity of it and yet each day, variation not only in time, but in impact – the tide pulling back the water to let you see the changes to the landscape from the day before. The map always changing. Jo: I grew up just along the coast from you, in Suffolk, my childhood memories are filled with visiting the beach as a special outing. It wasn’t so much the effect of the tide on the sea that I recall, but the salt marshes that you had to walk through to get to it. Watching the water either slowly ooze away, leaving wonderful meandering channels, or little wavelets pushing themselves back amongst the sea lavender. I have found this conservation we’re having quite tidal. I think of myself as a very private person, my inner thoughts and feelings well hidden under the water, but each day your words act like the moon, pulling the water away and revealing to me what is going on underneath, and quite scarily, exposing them for all to see! This entry was posted in 50/50 and tagged canal, map, salt marshes, Suffolk, Thames, thames estuary. Bookmark the permalink.